Amigurumi is the art of crocheting cute, small animals. 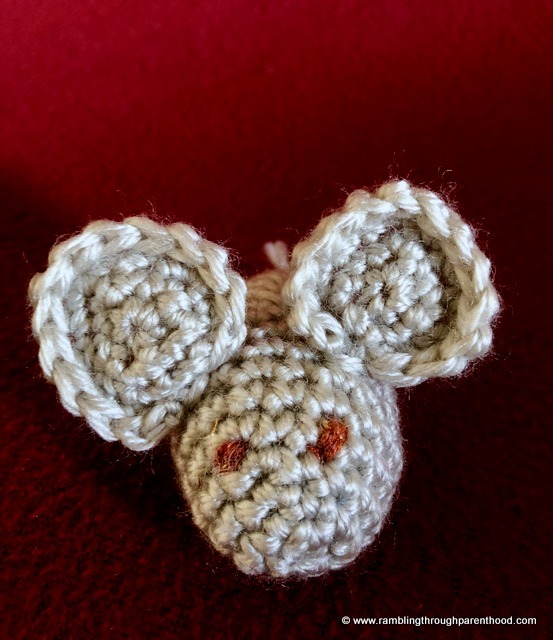 If this is your first time crocheting little animals, or your first time doing crochet, here is a fun and easy free pattern to crochet Squeek the Mouse. Squeek is cute, charming and is rapidly becoming a favourite snuggle toy in our house. Squeek will make the perfect Christening or Birthday present, an excellent Christmas stocking filler or Easter basket gift or just a lovely random present for any age. For Squeek is handmade and nothing beats a lovingly hand-crafted gift. Work this crochet pattern in continuous rounds without joining. Use a stitch marker to mark your place at the start of each round. Use any yarn you may have lying around the house and an appropriate sized hook. The pattern will not alter, just Squeek’s size in the end. The pattern uses only one type of crochet stitch, the single crochet (sc in US terms), also called the double crochet (dc) in the UK. All you have to do is keep working single crochet stitches, increasing by 3 in each round. Sc2tog is when you join up two single crochets into one sc. It is the way to reduce the number of stitches. 1 – Magic Ring (MR) with 6 single crochet (sc). Leave the loose end long and use this later for the tail. 12 and 13 – 1sc in each sc, so 15sc in total. Stuff the mouse with hollow fibre, washable, non-allergenic, non-toxic polyester filling. 14 – (1sc, sc2tog, sc2tog) x3 = 9sc in total. Stuff some more. 15 – (1sc, sc2tog) x3 = 6sc in total. Make sure to pull the yarn from the magic ring through this other end before tying off. Use a slip stitch to tie off. Leave a long piece of yarn for the tail. Use this piece and the piece of yarn leftover from the magic ring to make Squeek’s tail. I just knotted them loosely to make the tail. Use steps 1 to 4 above to make ears for Squeek. Repeat twice to make 2 ears. 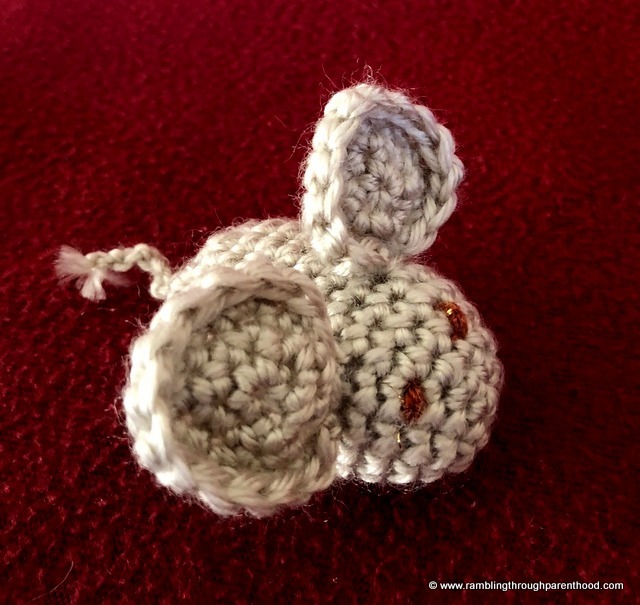 1 – Magic Ring (MR) with 6 single crochet (sc). Leave the loose end long and use this to attach this ear to Squeek’s body. 4 – (1sc, 1sc, 1sc, 2sc) x3 = 15sc in total. 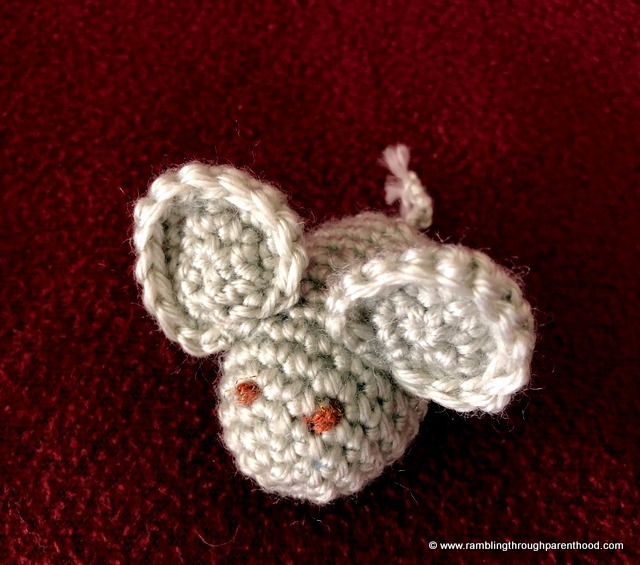 Tie off using a slip stitch and keep a length of yarn to attach the ear to Squeek’s body, between rows 7 and 8. Use a piece of yarn in contrast to the one you used for the body. So if you have a light Squeek, use a darker colour for the eyes, and vice versa. Slip the yarn through the sc between rows 4 and 5, and tie into a knot. 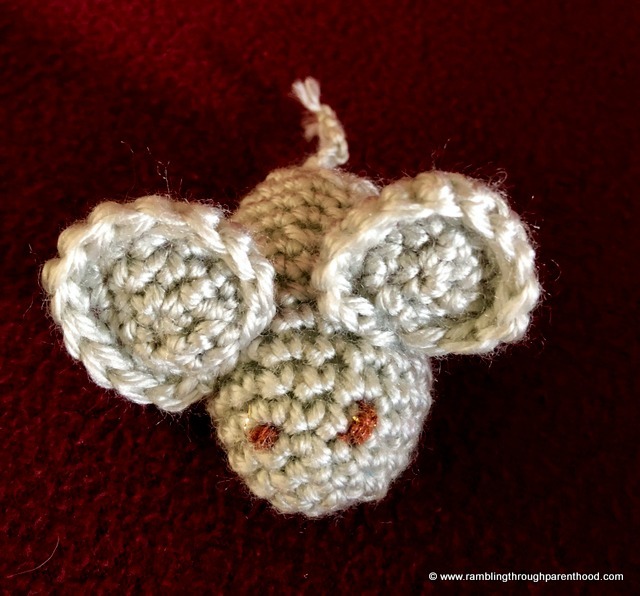 Repeat the knotting a couple of times, depending on how large you want Squeek’s eyes to be. Do you like to crochet? 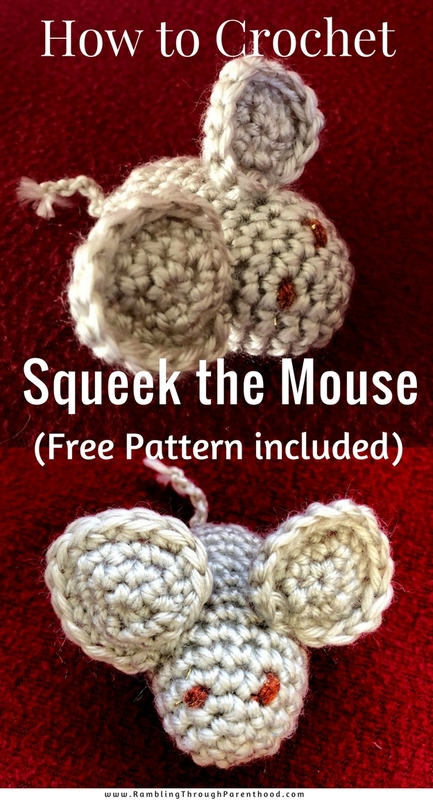 Hope you have lots of fun crocheting Squeek. This is super cute! I love how you have clearly explained how to do it. I don't crochet but its something I would love to learn to do.